System Requirements - The machine housing the integration must have at least .NET 4.0 and Internet Explorer 9. Alternatively, if the POS System is Cloud-based, there are no on-site System Requirements. Frequency - The integration can be configured to run automatically each night. It can also be run on-demand at the end of the day by one of the store managers. Data Flow - The integration is a one-way integration from the POS system to Restaurant365. Restaurant365 does not pass any information back to the POS system. Data - The integration pulls detail records from the POS into Restaurant365 each time the integration is run. Below is a sampling of the data transferred into Restaurant365. The integration creates a transaction in Restaurant365 called a 'Daily Sales Summary' (DSS) for each day and each restaurant location. 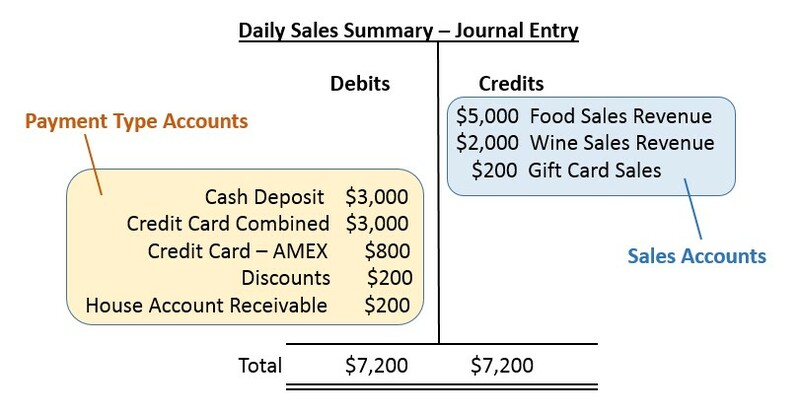 Part of the Daily Sales Summary transaction is a Journal Entry transaction that records the revenue, tenders, and discounts from the sales tickets in the POS system. Restaurant365 maps the sales & receipt details from the POS system to General Ledger accounts using Sales Accounts and Payment Type Accounts (in Restaurant365). The Sales Accounts always determine the credit side of the entry. Payment Type Accounts always determine the debit side of the entry. The integration creates a Journal Entry in Restaurant365 that accrues the labor expenses from time entries in the POS system. Restaurant365 maps the time entry details from the POS system to General Ledger accounts using Job Titles (in Restaurant365). Job Titles always determine the debit side of the accrual. The credit account (or liability) is set on the Location Setup Window.